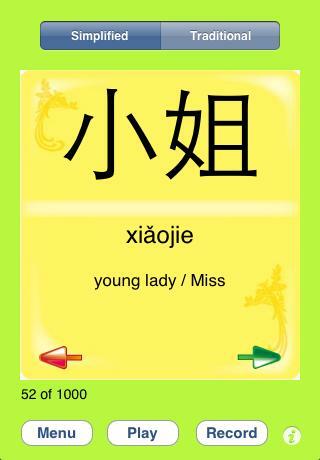 We are proud to introduce our second Chinese Flashcards app for the iPhone and iPod Touch. 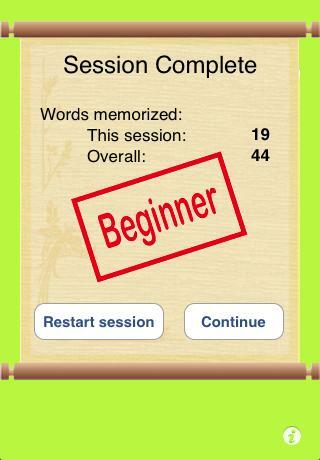 Usage: Go through the practice mode first to familiarize yourself with the words in the list. Once you are ready, you can start testing yourself in 2 modes. 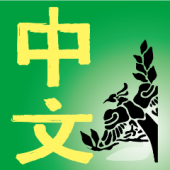 Character mode: View the word in Chinese characters (simplified or traditional). 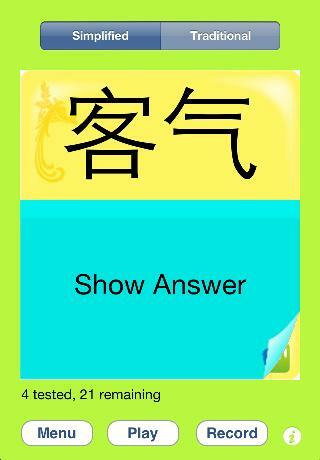 Decide for yourself how well you know it, then click on Show Answer to reveal the pinyin pronunciation and English meaning. If you guessed correctly, click on Yes and the word will be considered memorized. If you are not sure of it, click on No to have it shown to you again. If you choose not to study this word, click on Skip to have it removed from your learning list. You can also choose to have the audio for the word played back automatically when the word is revealed. Want to perfect your pronunciation? 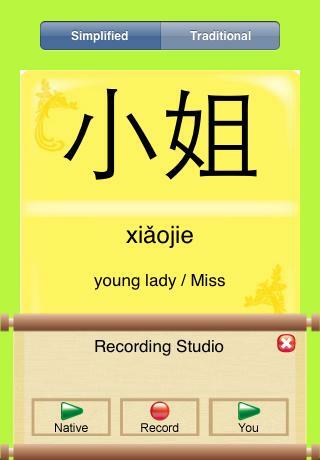 Then use the recording tool to record yourself and compare it to that of a native Chinese speaker. If you have suggestions on how this app could be improved, please leave a comment below. Back to our apps list. Can you explain how the recording function works ? It does not record when I pressed record button. I really like the audio test feature of this app. I’m having some problems with the app though. On the “Session complete” screen, the “Words memorized”, “This session” will only show 0. It did work at first, but now I’m stuck at an “overall” at 17. 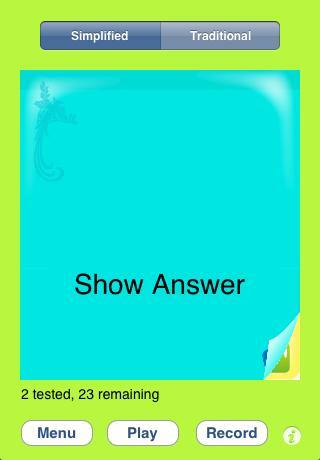 It does not matter if I answer “yes” to the “Did you answer correctly” questions. Is this a known bug? What can I do to get out of this state? Looks like a wonderful application. I’d like to have it but dont want to buy and iPod Touch or iPhone for just this app. Do you have it in any other format? It will be lovely then. You should allow more advanced users to skip ahead (both on this app and the character flashcards) so you don’t have to wade through the first 1000 characters or so…. Jinny: Hold down the record button. Wait till you see a line moving across the screen, indicating recording in progress. Let go when you are finished. 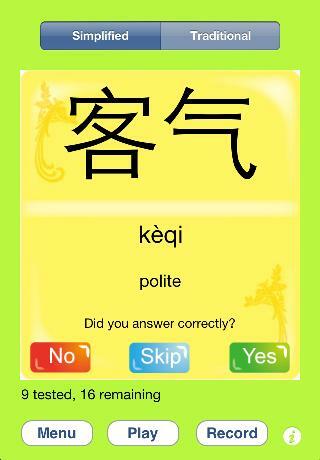 You will then be able to play the native speaker and yourself, and then compare the two sounds. Note: Your recording is NOT saved and will be deleted once you exit the recording studio panel. Oscar: I have not been able to duplicate this problem. Can you try deleting the app and then reinstalling it again? Let me know if you still have this problem. The version for the iPhone / iPod Touch was designed as a standalone product. Eli: Thanks – you can skip ahead in practice mode from the settings menu. I didn’t allow this in the regular mode, since one of the features of the app is to count how many words you know. If I allowed skipping ahead, then the word count wouldn’t be an accurate representation. How do I increase the volume of the voice play? I can barely hear the words? Use the standard ringer volume on your iPhone – the physical buttons on the side of the unit. Let me know if this doesn’t work. Hi, fantastic app. I’m making progress effortlessly with it. Would love an option to have a man pronounce the words for me. Well, it seems to me there is a mistake in duibuqi as printed on this page. (It should be 对不起The qi is not correct. If such a basic error is indicative of your product why should I buy it? Wow, you’re right – not good that I used that typo as one of the official screenshots! I’ve updated the screenshots and will now submit an update to fix this. Thanks for pointing it out! Sorry for the delay in responding. You can delete the app and reinstall it again. Apple won’t charge you, as long as you’re using the same iTunes account as before. Let me know if the problem still continues. I am having a lot of problems with this app. It keeps crashing. I had gotten through almost 750 Flashcards when it started doing this. I had to delete the app and start over. I’ve now had to do this three times. What is going on? Sounds like there is a particular character or word after 750 that is causing them. Let me do some testing to see what the issue is. Thanks!